These are good. So damn good that I nearly ate myself into a coma. My original intention was to make a treat for a presentation I had to give on the appropriate topic of Tasty Cities. What happened in the end was that I shared these with some friends and a birthday boy. Aside from multiple jokes about my balls, they were devoured in seconds. I purchased my first bag of Australian chocolate chips. This is a major accomplishment, considering that I had to accept the fact that the supermarket only sold dark or milk chocolate. Not semisweet, or bittersweet, or white. Ideally, I would use semisweet chips in chocolate chip cookies, particularly if they are Ghiradelli or Guittard. In the end, I purchased no-name brand milk chocolate chips and a dark chocolate bar. I’m not sure if I would call Australian’s chocolate situation as a shortage of chocolate types, but more likely, the United States has a diverse, extensive selection of chocolate available even in local supermarkets. Without an oven in my apartment, these Chocolate Chip Cookie Dough Balls are the perfect solution to a delicious, sweet treat made in no time. Because the dough is eggless, you can eat the dough right out of the mixing bowl. Any open invitation to eat dough out of the bowl is welcome to me. If you have the patience, wait a few hours after refrigerating the dough to make shapely balls which can then be dipped in chocolate. Cream butter and brown sugar until creamy. Add vanilla, then slowly beat in flour. Mix in milk, then chocolate chips. Keep dough refrigerated in order to make the dough firmer and easier to roll. 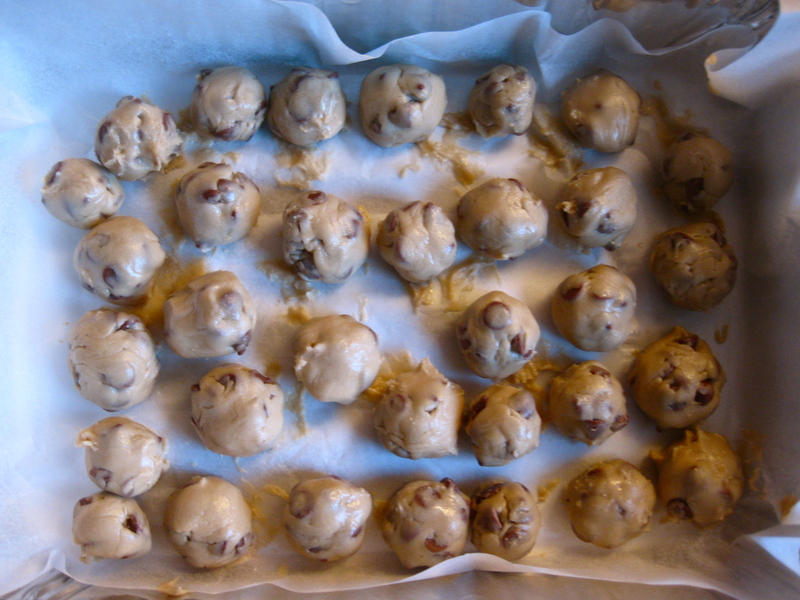 I refrigerated the dough for about two hours and then rolled the dough into balls. The following day I dipped the dough into dark chocolate, which I merely heated up in the microwave. Be sure not to overheat the chocolate, or else the chocolate can become grainy, dense, or oily. Break up a chocolate bar into pieces and place in a microwaveable bowl. Heat in the microwave for 1 minute, then stir. If the chocolate is still not melted, heat in 30 second intervals, stirring in between until chocolate is melted. Dipping the cookie dough balls in chocolate can be messy, but laying parchment paper on the countertop makes the process simpler. With a fork, skewer, or toothpick, dip the cookie dough in the chocolate until coated evenly. Set the dough on the parchment paper and let cool in the refrigerator.